Matt Maddaloni and Sean Isaac established a new route on the previously unclimbed northwest face of Wide Awake Tower in the Pigeon Feather group on the backside of the Howser Tower massif. This 1200 foot Rostrum-like pillar of splintered granite had been looked at and talked about but avoided due to its remote and overhanging nature. Maddaloni and Isaac worked on the route over six days, first aiding the hard pitches to some degree then cleaning them a bit and finally leading them free. 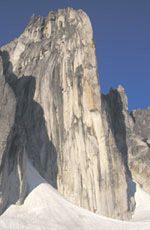 The 11-pitch route contained six pitches of 5.11 crack climbing. Maddaloni, hailing from Squamish thus the stronger granite climber, sent the harder pitches including the semi-bolted first pitch and the overhanging thin hand to fist corner of the third pitch, both 5.11+. They named their route Wild Fire (V 5.11+) after the numerous out-of-control forest fires that blazed all around the Bugaboo range during their stay. This expedition was sponsored by Arc'teryx.